Being a good citizen gets harder every day. Consider fire-fighting, for example. May 1st, 2004 was a scorching hot day. Forecasters were gloomily predicting a wildfire season as devastating as the summer of 2003. 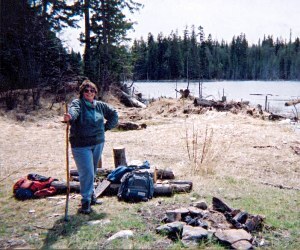 So, when our group of fourteen bird-watching hikers found an abandoned campfire blazing at the remote lake that was our destination, we were horrified. The overnight partiers had hauled in logs and stumps for their fire. Big logs and thick stumps. This was serious. We conferred. Who should we call. We were miles from the city. Would the cell phones even work? Besides, it was Sunday; no government offices were open. Even if one was, with government cut-backs, was it likely there’d be staff available to race into the country on a moment’s notice? The fire seemed to be our problem. One woman had a large Rubbermaid container in her car. Using it people carried water from the lake to douse the fire. They stirred the damp ashes and poured on more water. This shortened our hike but we felt we had to be responsible citizens. When we returned from the hike, we poured on more water just to be certain the fire was extinguished. Reasonably satisfied that, if that part of the country burned, it wouldn’t be because of our inattention, we drove home. Several days later I told a friend who works for government about our good deed. I waited for praise. What a surprise! "Did you have a certificate showing that you have taken courses and are qualified to put out fires?" demanded Tom. "Well, no, "I admitted. "None of us has taken a course. But, we’ve been going in the outdoors for years and have lit and put out numerous campfires." Tom considered this a poor rejoinder. His voice deepened and became more threatening. "Were you in possession of a permit to remove water from a lake or river?" he continued. "Afraid not," I conceded. "There wasn’t time to obtain one." As if that would pass for an excuse! There was more. "When taking water from the lake, did you disturb any wildlife?" Tom insisted. "Probably," I confessed. "The lake was full of ducks, geese, plovers and turtles. " What had we done? I quivered, imagining the headlines; "Local birdwatchers sentenced to thirty days. Convicted of tampering with wildlife, diverting water without permission and quenching a potential wildfire while unqualified!" To my relief Tom began to laugh. He confided that he favours common sense over ridiculous regulations. But…..there was that possibility. I contrasted this with a similar incident in 1985. A dozen of us had back-packed into the Bourne glacier in the Monashees. After ten days of hiking and climbing we were making our way through slide alder and devil’s club to the vehicles. There’d been several nasty lightening storms so we weren’t surprised to find a fire smoldering in the undergrowth below Pettipiece Pass. Our ice axes were the only tools we had. True mountaineers might frown on such unorthodox use, but those axes did a good job of digging out burning roots and debris. We carried water from a nearby stream in canteens and cooking pots. Eventually the site felt cold to the touch. We scrubbed the mud off our ice axes, shouldered our packs and continued down the mountain. When we got back to town one member of the group reported the fire to Forestry which sent a crew out to check it. Their report was that the fire "had been adequately extinguished". They sent us twenty dollars and the thanks of a grateful Forest Service. How times have changed! It’s confusing. Not long ago Forestry officials could and did compel ordinary citizens to fight fire in an emergency. Yet during the wildfires of 2003 two men who’d taken the fire suppression course but hadn’t received their certificates weren’t allowed on the fire lines. What should we teach Cubs and Scouts about correct outdoor behavior? And, how about Smokey the Bear? Does Smokey have a valid certificate?